This was my first thought too on seeing the dial options. A black/blue bezel could work really well to tone down the yellow and orange dials. The orange bezel might also work quite well with the black or blue dials (a la Planet Ocean). On similar or smaller production runs, the Halios Seaforth was able to offer dial, bezel and date/no-date options, so it would be great if Eddie were able to also. That said, in contrast to TZ, the Halios business model effectively works on upfront selling of the whole production run. I presume offering bezel flexibility would come at the cost of either eating into profit margins or increased retail price. When it all works on pre-orders, it's easy to get the numbers right. When you don't work on pre-orders, it's guesswork. I agree with this. Don't see the point of the watch being 1000m water resistant and really thick ... 1000 ft and 12mm much better ! I'm in the same boat. I'm actively searching for a bi-directional 12-hour bezel watch because I work with people in different time zones, but I don't need 1000 meter water resistance and never will. The original is a bit of a contradiction: the case is made for serious diving, but the bezel is made for traveling. Still both the original and the Smiths are gorgeous. I think there are a few in the same boat. I would love to see Eddie keep this watch as thin as possible. I think the last spec showed 30ATM so there's hope for us yet. Please Please make this happen. I’ve regretted selling my O&W 702 Caribbean numerous times and to have a modern equivalent would be amazing! I agree, both the yellow and the orange are screaming "Here is your summer watch!" at me - can we please have them in time for summer???? It's still a project but it's not the next one. I too would like to see this happen. The sort of watch I like and I would be keen to buy a blue one. 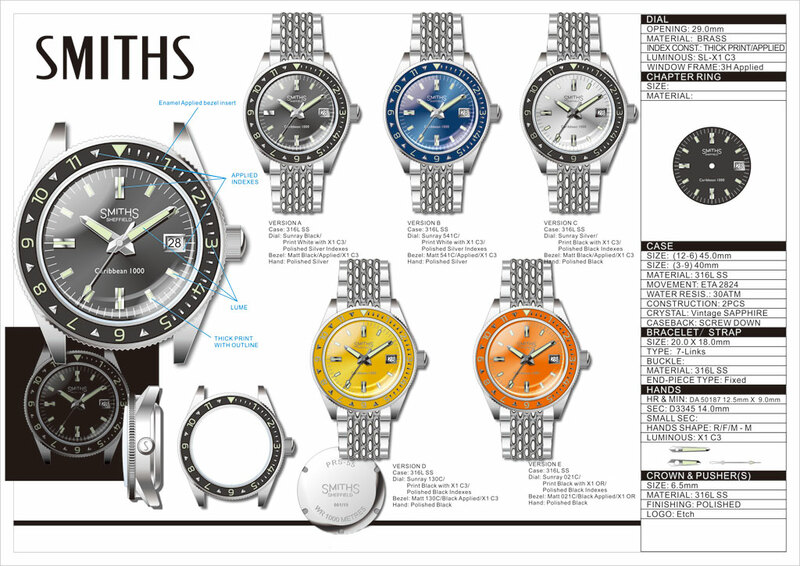 "Smiths Caribbean 1000 dive watch - September/October 2019." Great to hear. I guess I need to start saving. I’m in for one if there’s a no-date option. Still never found a use for the date function when underwater. I'm following this post keenly, it'll be either the orange or the yellow for me. Probably yellow. Could someone with image manipulation skills please mock up a yellow one with the blue bezel, I think it would be a corker. This might be of interest. It certainly caught my eye, wish it was UK based so I might have a chance to see it in person. The reason watches like the old Sea Dweller have a date is because it's a useful complication when you're on a boat at sea, for decompression, etc. The date complication makes a dive watch more of a tool, not less of one. That does look nice. Wonder what other combinations might work well from the colours already posted?? I can imagine it would be very difficult for Eddie to supply a combination but maybe if we had the bezel inserts available we could get them changed to suit? Having said that, I think the options offered will be awesome anyway and maybe best left alone!! I do like that colour combination. Found this thread because I bought a caribbean 400 (impulse buy, don't ask). Nice to see this modern re editions coming to life, hopefully soon. I am liking the blue one a lot.... How did you come across some ETA-2824 movements? I thought they were too hard to source now? Re-read the thread and there is a question about the potential to supply different bezels and the answer was no, which is fair enough. Just thought I'd mention it as I asked the question earlier and then saw that it had already been asked and answered. I was suggesting blue / yellow as a model in it's own right rather than a yellow with an alternative bezel fitted. Since the description says "crystal: vintage sapphire," I'm assuming the case would be more like 12mm, with the last couple of millimeters being a result of the box crystal, no?